Hopwood-based artist Paula Hamilton looks at some different uses for clay. Irecently started attending ceramic classes each week over in Leamington. Our tutor suggested we watch a TV programme on the history of British pottery. A gifted elderly potter, who had been working with clay for 60 years, said that he felt the process of manipulating and creating with clay made him feel like God. I was slightly taken aback by the strength of this statement but I think that I understand what he meant. Somebody who is very talented, taking a simple material like clay – it’s just earth after all – and making something beautiful with it by using their hands, heart and mind, feels powerful and creative in an almost unworldly way. While my own attempts at hand building in clay are crude and tentative, I am already addicted to using the stuff and confirm that while not yet approaching anything near feeling God-like, I do feel as happy and creative as a child with a new pack of Plasticine. Jane Mcmillan and Neil Spalding are local ceramicists in residence at Avoncroft Arts Centre in Bromsgrove and they both teach classes there. The building that they teach in is a beautiful old barn of a building that was originally the stable block of a large house. Jane Mcmillan is a multi-talented artist who studied glass and ceramics at college but who also makes and teaches textiles. Jane has a studio at her home in Alvechurch and uses the kiln at Avoncroft to fire her work, which is largely inspired by nature. Neil Spalding taught ceramics in schools for some years and originally came to Avoncroft as a student to pursue his love of the craft. Neil has a studio and three kilns at his home and has a particular interest in Raku firing, a process that produces a wonderful metallic sheen to the glaze. 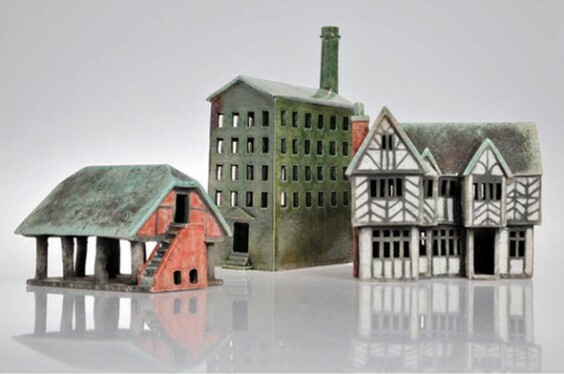 He makes models of buildings in clay which are all handmade and hand decorated (pictured above). Some complex pieces use as many as 58 separate pieces of clay. None of these buildings are exact replicas but are interpretations so that certain details may be omitted or accentuated. Last month I mentioned the work of Grayson Perry, the contemporary British artist, who is first and foremost a ceramicist. He won the Turner Prize in 2003 with his astonishingly beautiful and disturbing autobiographical pots. His work really demonstrates ceramics as an art form. Amammoth and very different kind of ceramic art to any of those so far mentioned was developed by Ai Weiwei, the Chinese contemporary artist, sculptor and social/political critic. The background to his 2010 ceramic installation at the Tate Modern in London, Sunflower Seeds, was as follows: In Chinese culture sunflower seeds are a common street snack to be shared with friends. Taking sunflower seeds as a bigger symbol, this sharing is a gesture of human compassion during a time of extreme poverty, repression and uncertainty. At the same time sunflower seeds represented the Chinese people themselves in the time of Chairman Mao. While individuals were stripped of personal freedom, propaganda images depicted Mao as the sun and the mass of people as sunflowers turning their faces towards him. Ai’s 2010 sculptural ceramic installation filled 1,000 square metres of the massive Tate Turbine Hall and appeared at first to be a vast, flat landscape of sunflower seeds covering the floor. Visitors were invited to walk across this plain of seeds and on doing so to discover that each seed was a unique porcelain replica seed, of which there were 100 million! The project took two years to complete. The idea of walking on this sea of porcelain seeds, of hearing them shift and crunch beneath your feet as well as the incredible sight they created, made for a sensory and immersive art experience. The fact that the work weighed 150 metric tonnes, that each seed had been carefully hand painted by craftspeople who were perhaps more used to painting exquisite porcelain tea sets, was not immediately evident in the work. Casually stepping across such a precious material and considering the effort and manpower involved in its creation is truly extraordinary. So I will continue to learn how to make better pieces of claywork and Jane and Neil will go on teaching skills to others and making beautiful clay objects. Artists like Grayson Perry and Ai Weiwei will create great art with the humble material that clay is. And the amazing thing is that similar activities have been going on since 6500 BC when man first discovered that when a certain sort of earth is heated on a fire, it becomes durable.